"I Wish to Say" at the San Diego Museum of Art: Van Tran dictates a postcard. Sheryl Oring used to be a reporter, and though she still uses one of the instruments of old-school journalism, she considers herself an artist. 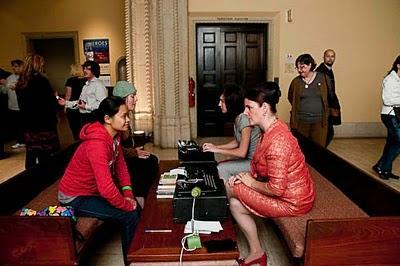 She takes a manual typewriter, dresses up in 1960s garb and asks people to dictate to her messages for the president. It’s all part of her project, “I Wish to Say,” which aims to give the people more of a voice. Host Frank Stasio talks to Sheryl Oring about her art and life.